Spending a day with Mac and Maction planet was the best decision my friend and I made during our time in Japan. Even though I had visited the city before and done many of the attractions in Tokyo already...Mac put together a customized and unique day, exploring areas of Tokyo that I would have never considered. Truly amazing. 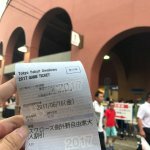 Our day consisted of visiting a shrine and having the best Soba noodles I'd ever tried, attended an FC Tokyo soccer game, and seeing the Tokyo Swallows with a group of supports and even a visit from the mascot. 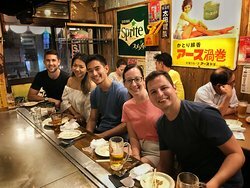 After a day jam packed day, Mac was happy to take us to Golden Gai, where his expertise found us at great spots to enjoy homemade plum wine. Mac doesn't stop at planning/logistics, he puts in the extra effort to make sure you are having the best possible time. We did two full days with Maction Planet in Tokyo and Yokohama as well as a Baseball tour and a Shochu Tour. We could not have been happier with any of them. We only had 3 days in the Tokyo area before heading north to Sendai. We were attracted to Maction Planet after checking out the website and seeing that Mac, the founder of the company, had travelled to over 100 countries. We are huge travellers ourselves and for us this badge of honour was incredibly important. It meant that Mac would be able to put what we saw in Tokyo within a global context. Our day in Tokyo was so incredible that it seemes wrong not to go to Yokohama with Mac the next day. Over these two days we ate like royalty for not much money at all, and outside of the big sights which we wanted to see we headed to places where we saw no tourists at all, which given what a huge tourism boom Tokyo is having is Testament to how much Mac knows This City. The Shochu evening with Christopher Pelligrini was a great introduction to the biggest selling Japanese spirit. As an expert Chris has the credibility. We bought copies of his book which was the first non Japanese handbook on shochu ever written! 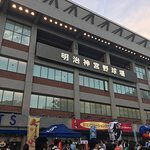 But for us the highlight was going to see a Swallows baseball game with Mac. Now you may be wondering why the hell would you pay a tour company to take you to a baseball game? The value add which Maction Planet offers here means your experience at baseball will be unique. You will sit with the true locals - people who have been going to games for 10, 20, 30, 40 years. Thanks to Mac you will feel like part of the family. You will be dressed appropriately as he lends you all the kit, including banging clubs and mini-umbrellas. So much fun and our best night on our Japan trip. Involved in getting between sites that we did not need a guide in these other places. 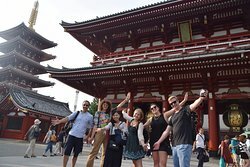 Full day customized tour of Tokyo: Last minute, great price, fantastic company, amazing time! I decided to extend my layover and send the weekend in Tokyo. It was a last minute decision, short stay, and I was traveling alone, so I made the decision to leverage a tour guide to maximize my time and minimize my burden. I sent about 10 emails out to various companies looking for someone to meet my needs. Understanding it was last minute, and during a holiday weekend, I knew it would be difficult and potentially pricey. A hand full of agencies wouldn't even respond. Others responded with an automate message, asking for time, payment and selection of tour. Since I wanted a customized tour, this wasn't an option. A few of the company's provided their ability, but demanded upfront payment before even considering my interest. It was at this point I received an email from MAC! owner of Maction Planet. The email was not an auto generated reply, but the opposite, a very specific email in response to my original note. He inquired about what I wanted to see, what time frames, food preferences, etc. It wasn't until we exchanged over 5 emails that price and payment came up, which I actually suggested. I offered to prepay, and he politely rejected, and said you can pay cash on hand (not required) when on tour. I provide this detail because it a lens into the person behind the company; down to earth, open, honest, and very interested in ensuring your Tokyo experience is second to none. We agreed on 8 our tour, which is what I paid for. The tour far exceeded the 8 hours and Mac did not ask me for a dime. I can say that by the end of the day, Mac was no my tour guide, but a new friend!! Thank you Mac for the great experience. Plan to see you in Tokyo, again, soon! My friend and I had a great day with Mac exploring Tokyo and experiencing not only a soccer game and a baseball game but so much more in between. We met in Shibuya and first headed to a shrine where Mac was able to explain the history, significance, and even quirky aspects of the shrine. From there we had the best soba noodles I have ever had in a restaurant that I would have never have ventured into on my own. At the sporting events Mac provided an experience that could not be matched. He provided jerseys, hats, umbrellas, and battons. As if all of this wasn't enough we sat with his group of friends and had an amazing time at the game. After our baseball game we went bar hopping around Golden Gai and had an experience we could only have with a local showing us around. All in all I can't recommend Mac enough. No matter what your interests are he will plan an amazing experience. He is extremely organized, professional, knowledgeable, and fun. First Class Tokyo Tour (and more) - fully customised for you. We did a full day tour with Maction Planet in Tokyo. We had never been before so wanted to have a good over view of the city. 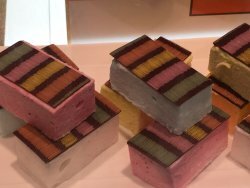 Temples, city scapes, food and technology. It was a surprisingly fascinating, entertaining and unforgettable day. Definately recommended. We do not usually do tours when visiting countries however having stumbled upon Maction Planet's website a bespoke tour sounded intriguing so I thought I would get in touch and see what they could offer. we had done some initial research and emailed Maction Planet with where we wanted to go, what we wanted to see and the timing of our trip. We soon received an email from the tour guide himself - Mac. He took on our suggestions and also made some additions to the itinerary to match our interests and around where to eat and how to fit everything in. He also took into account how much walking we wanted to do and how much we wanted to spend on food and drinks. A few email exchanges later and the day was set. On the day of the tour our guide (and company owner) Mac met us at our hotel. We then proceeded on a wonderful and memorable day around Tokyo. It included sorting out all of the necessary transport tickets, which was really helpful. The tour itself was thoroughly entertaining, informative and well planned, fitting in everything we had discussed at a comfortable pace. The food stops for lunch and at the end of the day were really good, never would have found them ourselves. Mac also talked us through the menus which was great so we left our comfort zone and tried new dishes and drinks. The price for the day tour I felt was very reasonable considering you get a tour created just for you. This did not include transport, food or drinks, but a fairly accurate figure was given to us about how much extra money to bring along. Note that we also paid for our guides food and drinks during the tour and this was included in the amount of spends suggested for the day. Mac himself was very welcoming, courteous, enthusiastic, knowledgeable, entertaining and professional. Finally, during our evening meal, Mac also gave us some great tips and information for the other places we were visiting in Japan during our trip. His knowledge goes far beyond Tokyo and he was only too pleased to share this information with us. It really made a difference to our holiday. 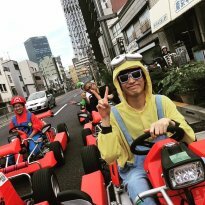 Would I recommend a Maction Planet customised Tokyo Tour? Definately, for anyone visiting Tokyo, I would recommend you get in contact with Maction Planet. Not only for the tour itself, which was first class, it was also a great introduction to the country and gave us more confidence for the rest of our trip around Japan - using public transport, ordering food and really understanding the culture. With this in mind I would recommend to book with Maction Planet early on in your trip to get the most out of it. If we're lucky enough to be in Tokyo again I will definately be in touch with Maction Planet again.